Ed. Sec. John Kings meets with teachers and students in Indianola. Mississippi needs to put more resources into education if the state hopes to see improvement in academics. 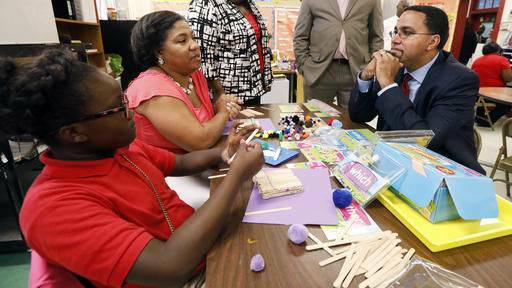 That's according to U.S. Secretary of Education John King. In Mississippi, the average school district spends roughly $9,500 per student annually. That money, which comes from state, federal and local sources, is less than the national average. And while the state has seen some improvement on test scores in recent years, Mississippi still lags behind the rest of the nation in reading and math. To improve education around the state, U.S. Secretary of Education John King says schools need additional resources. "That investment in critical to being able to attract teachers and retain those teachers," says King. "Those investments are critical to making sure kids have access to STEM classes and computer science. The kinds of things that will allow them to be competitive in the 21st Century economy." King points to towns like Indianola. The Sunflower County community received a $30 million grant five years ago to become a Promise Neighborhood. The program provides resources for services including preschool, tutoring, summer camps and access to social services in an effort to boost academic achievement in schools.